Sketches of Canada for March 8th! March 8, 1971 – Closing of Halifax’s Pier 21. This Canadian History for Kids exclusive, looks at Pier 21, the Gateway to Canada. Located on the Halifax Harbour front, Pier 21 has long been called the Gateway to Canada – and with excellent reason. Between 1928 and 1971, the ocean liner terminal and immigration building welcomed over 1 million immigrants to Canada, mostly from Europe. The pier was also the most important departure point for almost half a million Canadian military personnel during World War II. The facility became known informally as the ‘Gateway to Canada.’ It closed in March 1971, due to a considerable drop in immigration traffic as transportation methods switched from ocean-going-ships to jet airliners. Upon the immigrants’ arrival, officials supervised the screening and completion of the paperwork needed for their right of entry into Canada. Among those who anxiously waited to be granted entry into the country were those looking for employment in the New World. Also British Home Children, Jewish war orphans and refugees from across war-torn Europe. 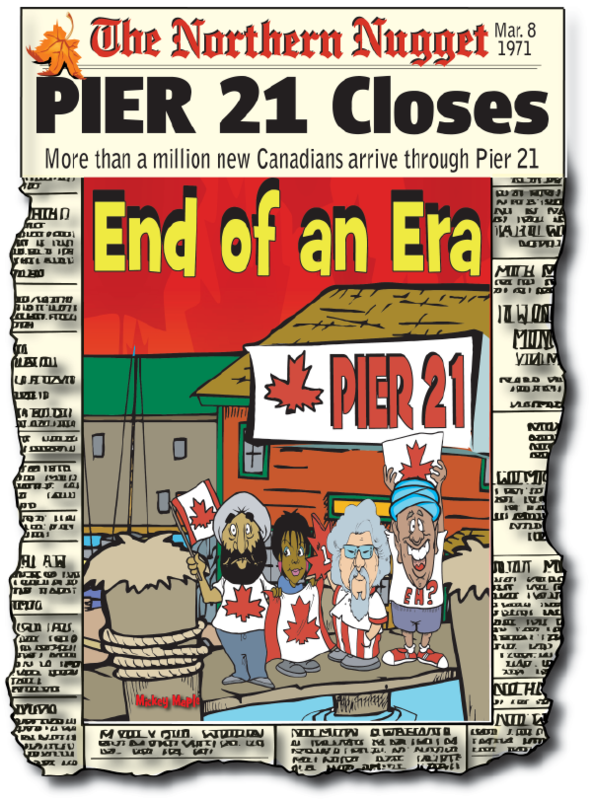 Canadian History for Kids has learned that in 1996, the Canadian government recognized Pier 21’s important role in the lives of so many immigrants and their descendants by naming it a National Historic Site of Canada. It is also the last immigration building still standing in the country, making its protection even more important. The Canadian Museum of Immigration at Pier 21 opened as a National Museum of Immigration in 1999, offering visitors the chance to look into the immigrants’ experiences and to possibly discover a family connection to a place that offered hope for a better life. Visitors can now take an emotional journey through the stories of the immigrants, seeing and listening to their experiences as they arrived in Canada after days at sea through a collection of arrival and departure sources dating back to 1865.